Elders at differing levels of mobility and autonomy choose to seek senior-oriented housing for a great diversity of reasons. Health Facilities Group’s Master Plan for Smith County Senior Care accommodates the full spectrum of elder care needs. This mission required thoroughly understanding the respective requirements of the Long-Term Care, Assisted Living, and Independent Living communities. Each of these classifications of care poses unique architectural challenges, from the placement of nursing stations in Long-Term Care to the convenient placement of parking for elders in Independent Living. 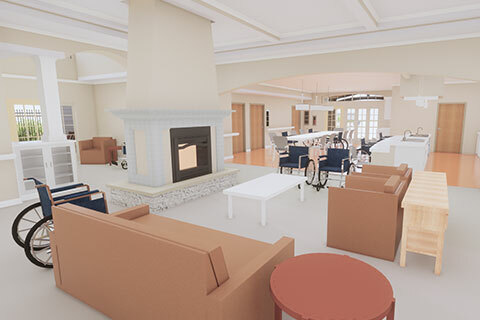 Common to all senior living design, however, is the obligation to create a sense of community that invites elders to feel at home with their peers. Health Facilities Group has placed itself at the forefront of elder care design through its commitment to encouraging neighborly friendships through warm and centrally located common spaces. Health Facilities Group developed a Master Plan for Smith County Senior Care that includes six Green House Long-Term Care homes, Assisted Living facilities, and a two-story Independent Living tower. Currently under construction are two 12-bed Green Houses for Long-Term Care and a 14-bed Assisted Living home. Our Master Plan also features a daycare/pre-school unit that would fulfill a community need while fostering mutually beneficial interactions between children and elders. Smith County Senior Care is part of the campus of Smith County Memorial Hospital (also designed by HFG), which is located only a quarter of a mile away. This proximity facilitates the sharing of resources between institutions and ensures superior access to medical services for residents.